Yup, I am completely and wholly Mad about Marfy. The fit! The cut! 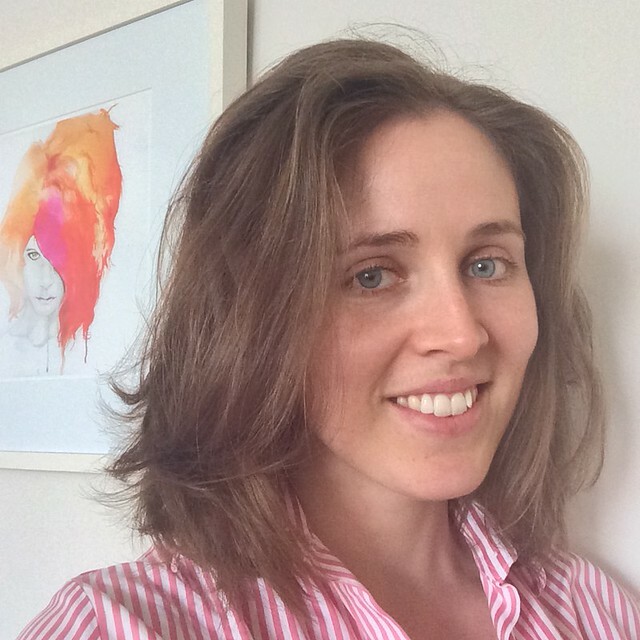 I’m a huge fan of the swooping circular neckline – it hugs your decolletage and doesn’t even undo your modesty when you need to bend (or slouch) – and how the shoulders are ever so slightly ‘off’ the shoulder. 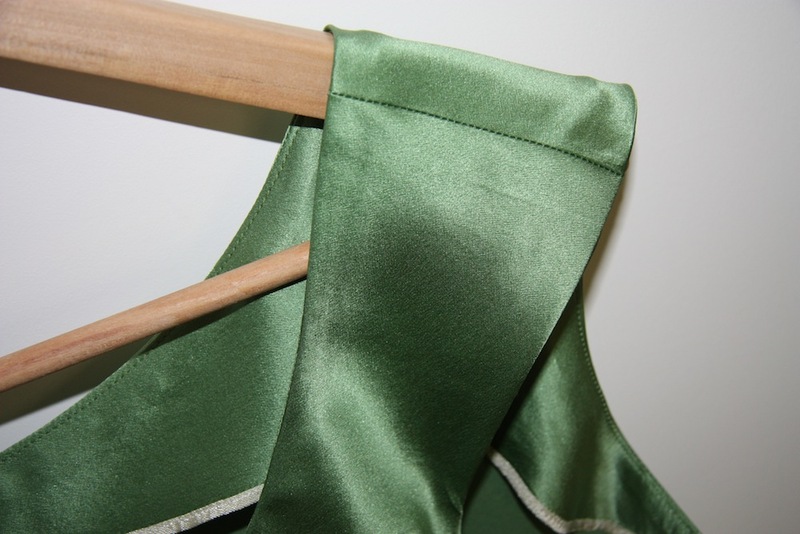 Made from a beautiful oak green silk charmeuse that was rescued from the remnant bin at Tessuti. It was indeed tricksy to work with, but it feels so luscious that I feel like a million bucks just putting the thing on. Actually, this is a surprisingly simple top, which came together in very short space of time (over two evenings) – once of course, I’d figured out what the markings on the pattern meant. That did take a while, and included a bit of seam-ripping on my first time around that mulberry bush. Thank goodness for toiles! After that, it was delightfully simple to finish off – sew together the shoulders, sew the facing around the neck and arms, then the side seams last. Really very quick to put together – I promise! I finished my seams off with some cream rayon seam binding. This is the first time I’ve tackled a slippery silk that was destined for outer wear, rather than being hidden away as lining. Just the thought of cutting out silk gives me chills, but no longer. My beau bought me an incredible invention for Christmas – one of those nifty self-healing cutting mats and a rotary cutter! Oh, I’m in heaven. It’s SO much faster, more accurate, no more hand cramps, and once you’ve got your silk weighted down, it can’t slip’n’slide anywhere. I still use a sharp little pair of embroidery scissors when it comes to concave corners, but otherwise, I’m hailing it as the best invention EVER. Well, since the sewing machine, anyway. To avoid the task of hemming, I finished it off with some of the charmeuse in reverse, giving a lovely contrast between matt and shiny (which is surprisingly difficult to catch on camera). This conveniently averted my absolute loathing of hemming, and avoided any stitches on top of the silk. For those of you who are curious about Marfy patterns, I say go for it – this has been such a positive sewing experience for me (only one tiny alteration – taking in the side seams 0.5cm both sides) that I’ll definitely be buying some more of their patterns. In fact, I’ve got a cup of tea handy and I’m about to head over to their website. If you’d like more information on measurements and the amount of ease, you can see my post on my toile of this top here. If you’re planning on making this at all – I ended up using about 1.1m of fabric that was 1.35cm wide, for the size 46 pattern. This is beautiful! I love the details and the color. 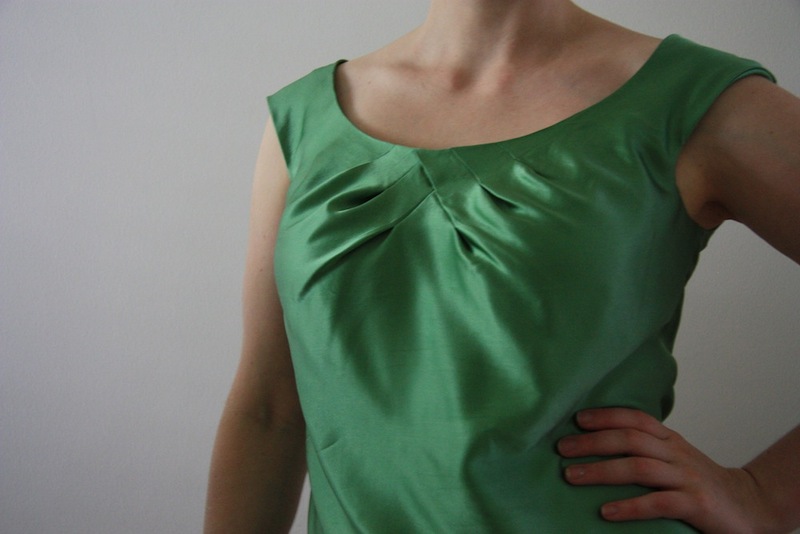 Charmeuse isn't always the easiest to work with but your sewing is perfect! Fantastic – love the top. We have the Marfy Catalogue at work and was wondering whether to purchase some but was unsure. Thanks for posting and recommending them – will give it a go. Love the use of the reverse fabric on the hem and that's a gorgeous teacup!! 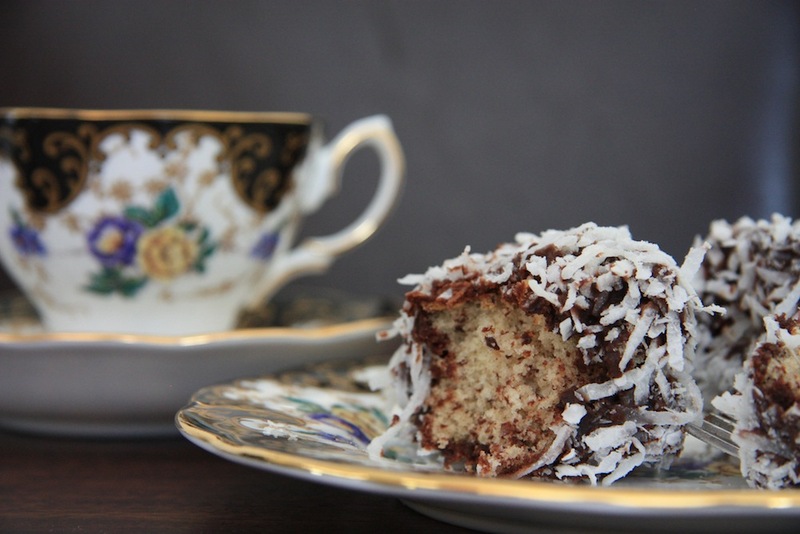 and the lamingtons look scrumptious – what else would you have on Australia day with a good cuppa!!! Looks amazing! I love the color and the fit looks perfect. Oh wow. This is everything dreamy and elegant. Love the color, the pleats, and how beautifully you finished it. Brilliant, too, your method of avoiding hemming! This top is so beautiful, I'll be sure to buy a few Marfy patterns once my skill level allows for it. ooh this is so lovely! You make it sound easy, but I still find it very difficult indeed to work with silk. It gives me the heebie-jeebies! Well done you. Great work on the hem and the colour is fantastic! The silk mixed with the green just looks so decadent. I love that you can dress it down with jeans also.Your seam binding looks so neat; I've never used rayon binding before. Can I ask where you got it? Ooooh, it looks gorgeous! Well done you. Can't wait for you to make more Marfy patterns. Very inspiring! Wow! Beautiful! I love your hem treatment. I've always been too nervous about the lack of directions to try Marfy, but I'm thinking it may be time to give it a go! You did a wonderful job on that top. It is exquisite. I'm also curious about Marfy but am so afraid of the idea of not having directions. This is absolutely gorgeous! So flattering and lovely on you! Ooh, thanks for the heads up Evelyne – I didn't realise Tessuti had the catalogue! I am going to have to come in and look through that, especially as I was almost considering buying it too. Hope you had a fab Aus Day as well! Try Fabric.com :) You can buy it in rolls of 100 yards, and their about $9. With the exchange rates the way they are… buy a few! I love this seam treatment, it looks classy! This is such a lovely top. The fit is great and I love your hemming (or non-hemming) idea. That's so lovely! And Snaps but I found in the Sydney Tessuti remnant bin an (almost?) identical silk charmeuse a week or 2 ago – I can't tell if the shade is different but VERY similar at least! 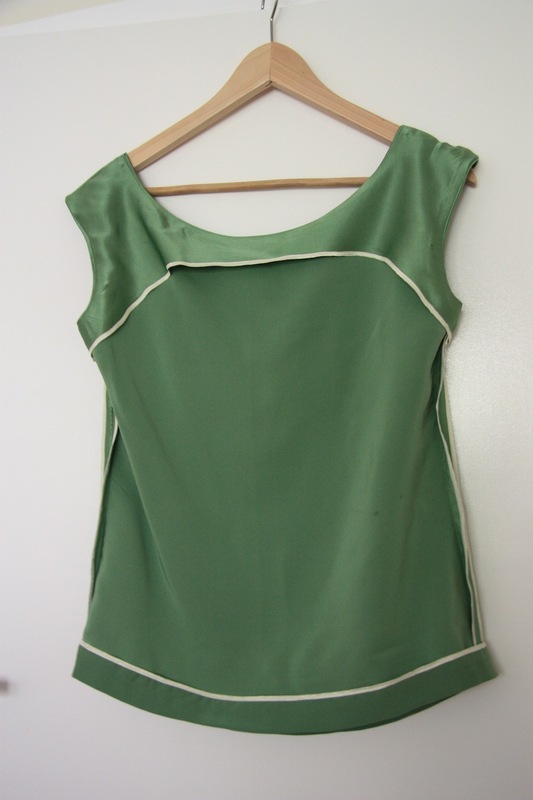 I'd just bought a 2nd hand camisole pattern (circa 1980s – remember the Brooke Shields for McCalls line?) earlier that day and I've been saving it until I can get around to getting…. a rotary cutter and mat!Very timely post. I think it's a sign. That is absolutely lovely. I really like how you've teamed it with jeans. Not sure I'm capable of such a neat make with slippery fabric like that. I'm totally stealing the hem idea! That's brilliant. What a beautiful top , the colour is divine. I am also stealing the hem idea. Gorgeous top! You did an excellent job. I don't have much experience sewing with "slippery" fabric, but I may have to give it a try!On a side note…I love your jeans! Do you mind sharing who makes them?